Cognitive Systems Research is dedicated to the study of human-level intelligence. As such, it welcomes papers which advance the understanding, design and applications of cognitive and intelligent systems, both natural and artificial. The journal brings together a broad community studying cognitive architectures in vivo and in silico. It aims to integrate ideas, concepts, constructs, theories, models and techniques from across different disciplines and different perspectives on cognitive architectures - both biologically-inspired and non-biologically-inspired - and the development and application of cognitive systems. Cognitive Systems Research plays a special role in fostering and promoting the 'BICA Challenge' to create a real-life computational equivalent of the human mind by devoting two special issues to BICA related topics each year. 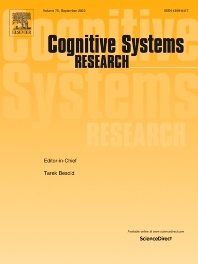 Cognitive science: including autonomous cognition and metacognition, imagery, sensemaking, meta-learning, self-regulated learning, life-long learning and cognitive growth, "critical mass" of a learner, natural and artificial creativity, affects, emotions and feelings, emotional competence, social cognition, the self, human-like episodic memory, language perception, processing, production, acquisition and development. Experimental psychology: Empirical studies on the topics listed above will be considered if they are supplemented by computational modelling studies. Computer science and artificial intelligence: including cognitive architectures, virtual and physical cognitive robotics, synthetic characters, bootstrapped and human-like learning, human-computer interface, vision and computational linguistics. Neuroscience and neuromorphic engineering: including system-level computational neuroscience, cognitive neuroscience, models of the neural substrates of semantic and episodic memory and awareness, agency, emotions and feelings, theory of mind and social cognition, language, imagery, voluntary control, goal and value systems, spatial cognition and the implementation of new computer substrates such as neuromorphic engineering.